After vaping my other cookie recipe for a couple months... I got bored with it. So this is a cool version that fits the exact profile instead of really using your imagination with the other one. This is a really fantastic recipe. Subbed in FA Cookie the first mix but ordered JF Cookie to make it as intended for the second time. It's delicious both ways and worth ordering anything your missing to mix it up. It nails the cookies and cream profile so perfectly for me, the cookie in particular is stunning. Thanks very much for this! This is a really good cookie vape and trust me I know because it is my favorite flavor profile. I vape this stuff every day now. I really hope you keep mixing and sharing because I love how you use different flavor concentrates. I don't mind ordering new flavors because it really switches it up in a good way. I learned a lot from you on in the mix DIYorDIE YouTube and really appreciate it and hope you keep mixing. This is so delicious and addicting! 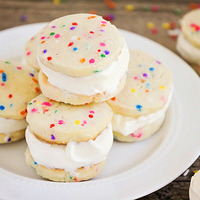 Taste exactly like sugar cookie ice cream sandwich. Awesome job Thadentman!